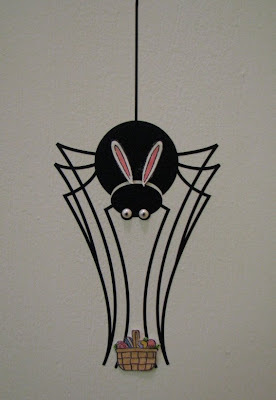 Craftin' Caro: Spidey is all dressed up for Easter! Spidey is all dressed up for Easter! Yes, it was time to update Seasonal Spidey and bring him into Spring, complete with bunny ears and an egg basket. Be sure to say hi to him when you come by the studio!! LOL! I love Spidey Cottontail! LOVE your Easter Spidey! SO cute!